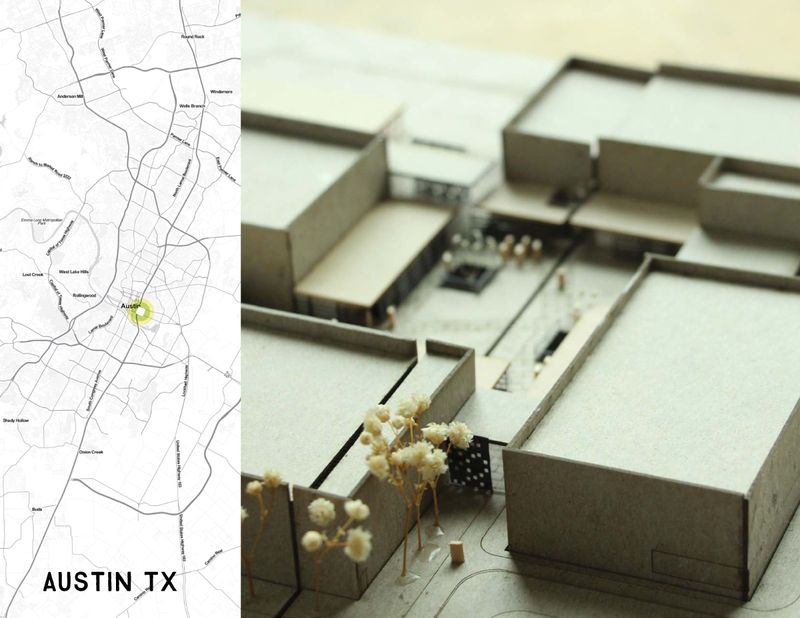 The assignment here was to create a film production studio near downtown Austin. It had to have a variety of soundstages, green room suites, editing rooms, offices, and support spaces, ample construction and loading zones. Filming is very private, very intense, and very internally focused. My partner and I both believe that nature is crucial to mental health, and since this was going to be so intense, and it’s usually very industrial, we decided to structure and organize our complex around the idea that immediate access to nature is a crucial programmatic need. The big move was to create a central courtyard which organizes the spaces, acts as a reprieve, acts as circulation, event space, relaxation space, etc. 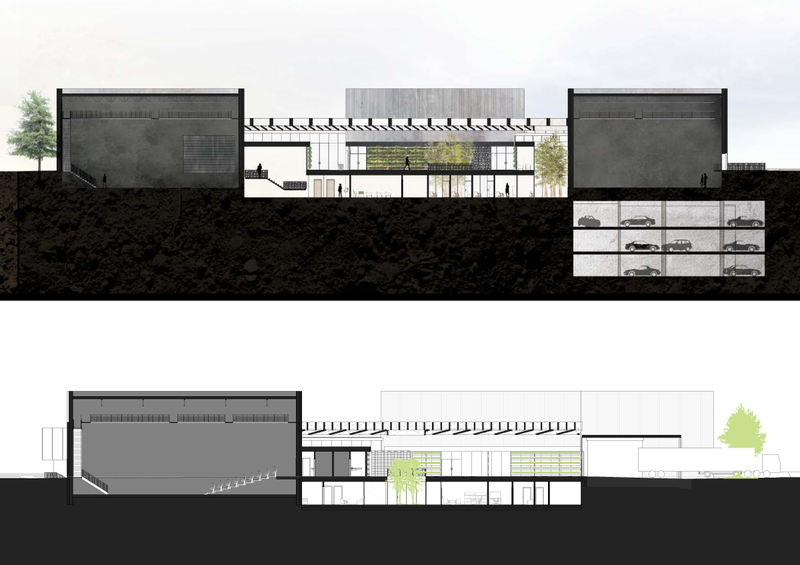 The soundstages are located around the edges, which create the requisite privacy on the site, allowing the courtyard to feel public and relaxing for those on site, and also starts to break down their massive scale. 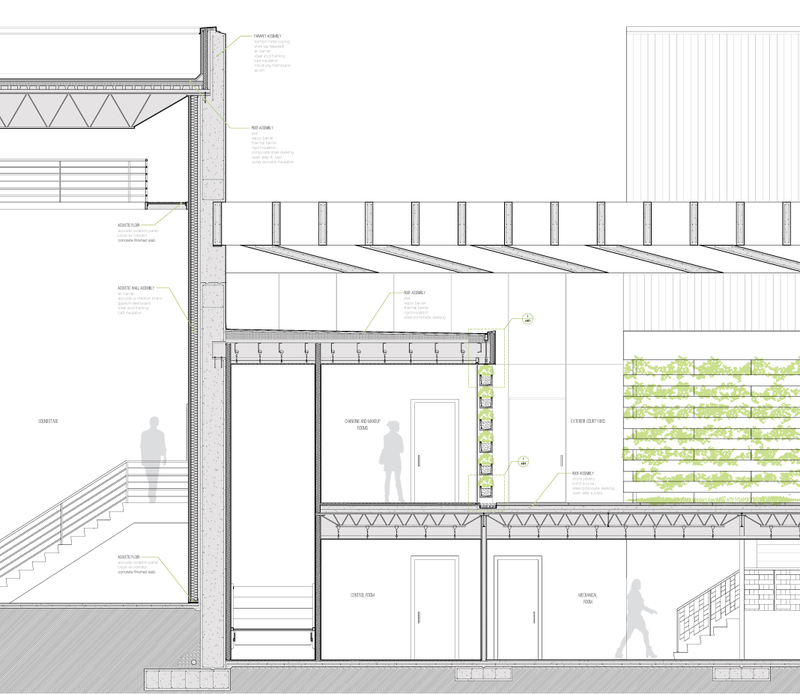 There is a grass lawn, planted walls on the sides of the green room spaces, and it’s capped with a brise soleil. The brise soleil is made of monolithic precast concrete beams, leaving the courtyard column free. They’re 3’ tall, 4” wide, oriented to solar grid, true North-South, as opposed to street grid, to which the building is oriented. The bottom fins are angled for optimal light in the winter and shade in the summer—crucial for making the courtyard actually pleasant to be in year round. There are greenroom suites for each soundstage. Their walls are planted with lines of flowers. The inside of the walls is glass curtain wall (with curtains in certain rooms like change rooms, for privacy). So that nature is immediately visually present. Each greenroom suite is 2 stories tall, with the second story below ground. 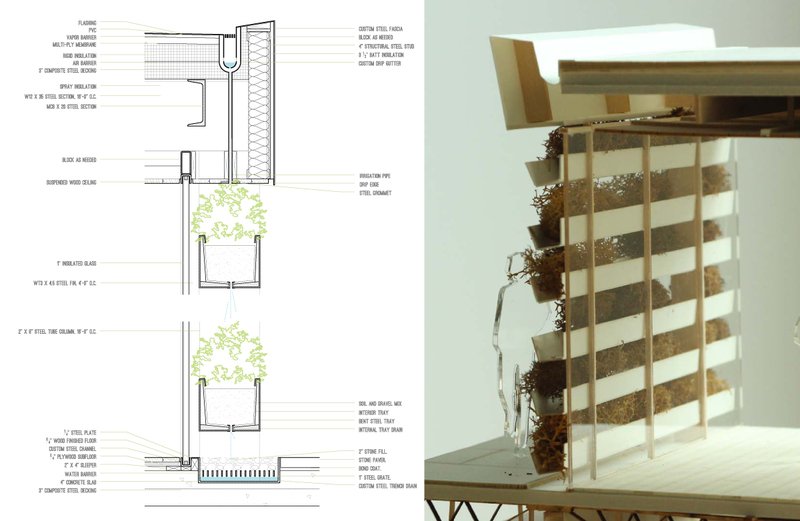 So they have garden courtyards that pierce through—giving them immediate access to nature from below (above can step into the giant courtyard). 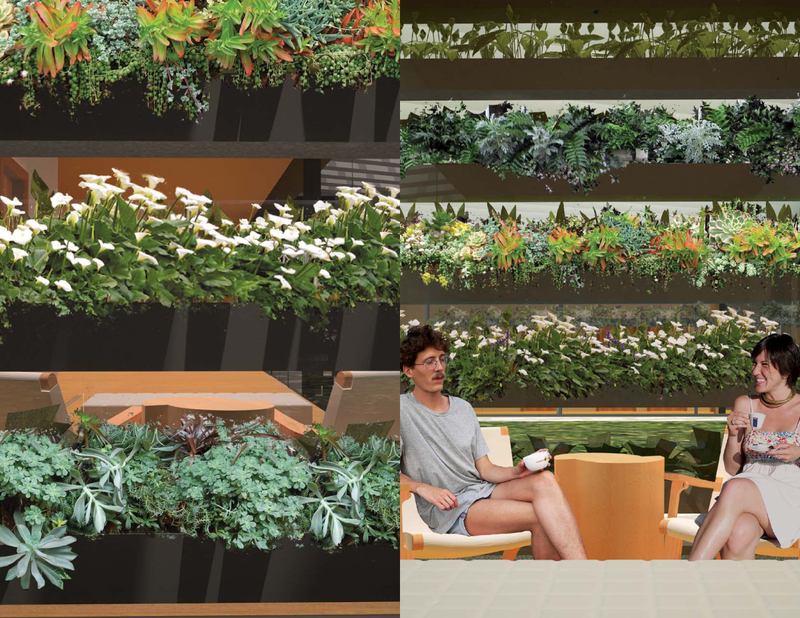 It also visually brings nature into the upper levels of the green rooms even more. We went underground instead of up because film studios have a bunch of program that requires absolute silence and darkness (not to mention, a huge amount of mechanical space). So, we buried all of that, including the editing suites and some of the supplemental office space (this also made the courtyard available to be open. Again, we wanted immediate access to nature, so we created two more courtyards that pierce down. The offices, which aren’t light and sound –tight, face it directly with visual connection. Editing suites, are nearby but without visual connection. There is an office and a residence as well, but they engage the nature on the public side of the building since they’re not so confidential.